Limit of Vision is a science fiction novel by Linda Nagata. Finally a Nagata novel is published in Europa and finally I get my hands on her latest book. Limit of Vision takes a look at an non-human intelligence and the some of the options we may have in out near future. About fifty years in the futures three of your average mad-scientist types are working on small intelligent machines that that can cluster together for more processing power when needed. They call them LoV's as they are just big enough to be seen (on the Limit of Vision if you will). The Lovs are forbidden on earth, but being true to the mad-scientist role they have transplanted colonies of Lovs to their own foreheads, where they co-operate with theirs minds. Soon one of the scientists are found dead and the remaining two have to run, not just for their lives, but for their LoVs. The LoVs end up in a rice field, protected by a cadre of youngsters governed an artificial semi-intelligence (think The Primer from Neal Stephensons Diamons Age) and the rest of the book follows the fight to keep the LoVs safe and to give them a chance to evolve. And evolve they do – Nagata takes us interesting places indeed. Limit of Vision is a lot more normal the what we have seen in the Bohn Maker series. Most of the character are fairly easy to understand and their motives are not as alien as we have sometimes seen from Nagata. 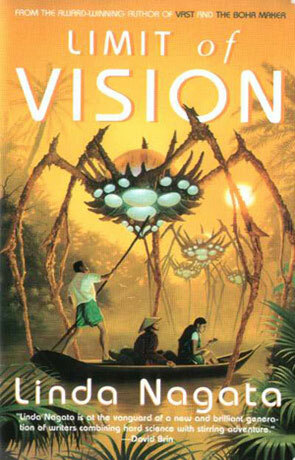 Limit of Vision takes place on the brim of a new world, making it easier to understand, even if most of it takes place in Vietnam and even if most of the character are half way alien. But I better stop with the comparisons to Natagas earlier work as this one is quite different. It starts of kind of slow, but it soon gains momentum and I gulped down the last half in one sitting. Recommended. Written on 13th August 2002 by TC.